Home » technique	» What’s your process? From time to time, customers will ask me if we offer any classes on “yarn blending,” i.e. 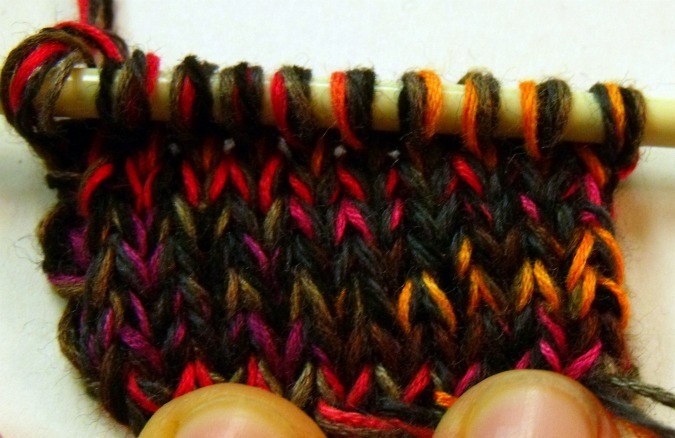 how to know which fibers or colors will or won’t go well together. While this would be a super fun class to teach, I feel like it would also make me feel a little weird to teach it. 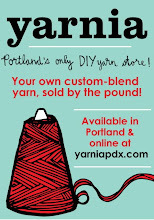 I know Yarnia is unlike any other yarn store, there’s no doubt about that! In creating a yarn shopping experience for which most customers have absolutely no context, I feel like it’s my and Angela’s duty to walk you through that process, every time you come into the shop, if you want! It wouldn’t really serve anyone to have the avenue to successful yarn creation be blocked by a $25 class fee. That being said, making cool-looking yarns definitely comes with practice, and if I can share with you here some of my process, all the better. So like I was saying last week, amongst the plethora of knitting projects I packed with me to take to New York, was a brand new pair of hoodie gloves — one of my favorites, and now that cold weather biking is upon us, I knew I’d better get on it! 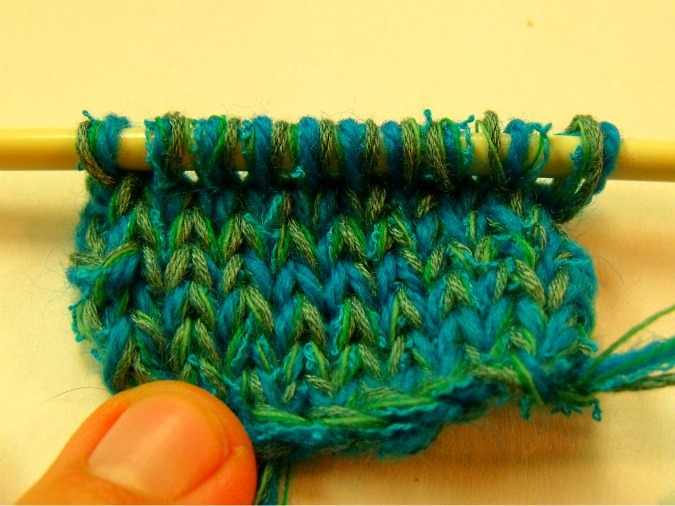 With such a relatively small project (I’m more of a sweater-and-blanket kinda girl, so the prospect of only needing 4 oz. of a given yarn is totally novel to me), and a no-need-to-be-subtle garment like gloves, I was overwhelmed with options. So I considered, what are my constraints? I knew I wanted soft (–>bamboo), warm (–>wool), dark (rainy bike handles get dirty quick!) and pretty. Oh, and DK weight, because hoodie gloves on Size 7 needles are my fave! I started with one of my favorite colorways of bamboo. Then I added in a strand of black bamboo, just to see what the contrast would do. 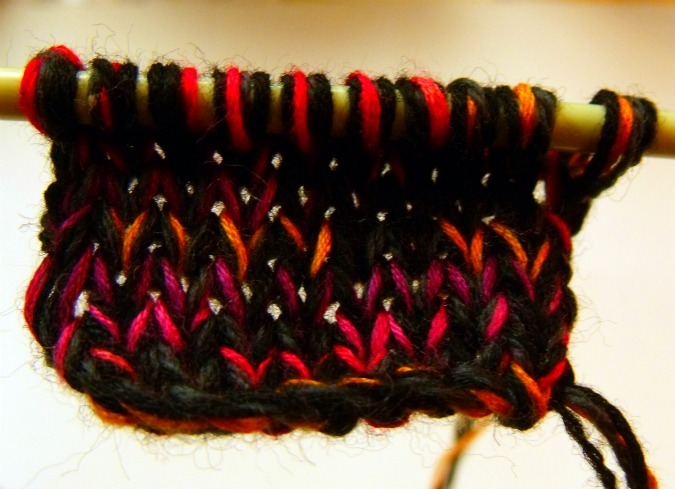 To build up to the DK weight, I added in a strand of black merino, and an off-black regular wool. I liked this, but something about it was just too calypso/Jazzercise for me. I tried an entirely different direction to see how I truly felt about this. Blues and greens, also wool and bamboo, with just a thin strand of this fun little acrylic novelty yarn thrown in for some texture. I liked it, but while I was swatching it up, that first blend kept nagging at me. What if I toned down the black contrast by subbing in a brown bamboo in its place? Then I spotted it, another variegated bamboo, this one sporting a variety of blacks, greys, and browns. I replaced the black bamboo strand with this one, swatched it up, and I knew. It was the one. Do you have a custom yarn success story? Failure? Question? I’d love to hear it.